Please note the following dates and times are tentative and subject to change. We recommend calling ahead to verify dates and times as workshops draw nearer at mcdougalsfarm.com. CSA members will be contacted by email. You can contact us at mcdougalsfarmllc@gmail.com or 715-627-4418. Note: The Children’s workshop usually held in March in the greenhouse will be set at a later date this summer so we can explore the great outdoors with nicer weather. Hoping to have a sunny Earth Play Day. Greenhouse opens for sales. Open to the public for two- 3 day weekends only. Filled with many earthy mossy delights, rusty accents, hanging baskets and organically grown garden transplants and herbs…many of them heirloom. Love nature? Looking for unique? You will find it here, located at W10835 Bluebell Rd. Deerbrook Wi. Just 5 minutes N on Hwy 45 from Antigo to Cty Rd. B., turn west and then straight onto Bluebell Rd…see you in a mile and a half on the left. 2 back to back HERBalicious evenings! Enjoy a fresh brewed cup of tea or a glass of wine as we go around the large selection of herbs and talk briefly about some of the medicinal and culinary uses of herbs and introduce you to some new ones. Then you will be free to design your own herb container garden. Bring your own container, we will have a few on hand. Cost will be determined according to your container size and herb selection. Space is limited. Please call ahead. May 18th, Sat at 6pm, Harvesting the Power of Herbs! McDougal’s Farm welcomes high energy Herbalist, Kelly Keyser-Millar. Owner of Mortar & Pestle Herbal, Kelly will be diving deeper into the medicinal actions of herbs and how to transform well known kitchen herbs into home remedies. Using mason jars, Kelly will show us how easy it is to make herbal infused honey, extracts, tinctures, oils and more! Class is FREE. 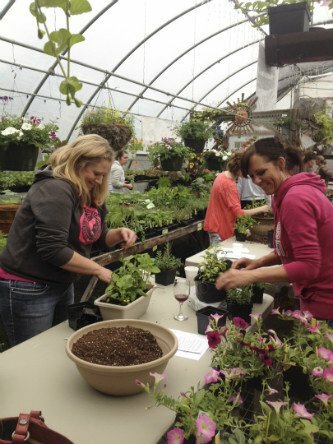 Potted herb plants available for purchase following class if interested. Space is limited. Please call ahead. May 24th-26st, Friday thru Sunday 8am to 5pm- Memorial Day weekend. McDougal’s Farm Greenhouse open for sales. Our second weekend open to the public, good deals on selected remaining annuals. Always adding new plantings. Come see us for unique and all your garden planting transplants. Special deals Sunday 1-5pm. McDougal’s Farm is proud to be included in the 2019 Sustainable Farm tour. We will be one of the six sustainable farms open to tour. Come see us! Take a guided tour through our patchwork type fields and hoop houses which include a large variety of flowers, herbs and veggies, giving our visitors an up-close look at the growing methods used to keep the farm sustainable and chemical free. You can also choose to visit The Bures Family Organic Dairy Farm, The Grandview Orchard, Igl’s Organic Potato Farm, Tapped Maple Syrup or Canopy Gardens. This is a great opportunity to meet your local farmers and ask question. Tours times are 9am, 11am, and 2pm (choose 3 farms). Tour cost is $5. for the day and tickets can be purchased at Sweet Thyme or the Green Hen in Antigo. Let the McDougal Farm crew cook for you! 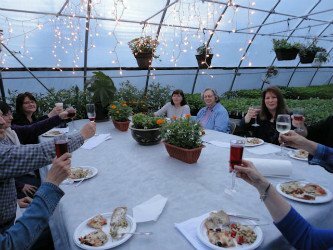 Come for a relaxing evening, have a glass of complementary wine, and watch while we use all the farms bounty and freshness to put together a variety of different pizzas and show you how easy it is to cook with fresh herbs. Cost is $15. per person or $25. per couple. Space is limited so please call ahead to reserve your seats. Farm Events: In the past we have had events such as Earth Day/Earth Blessing, Open House, Movie Night and our favorite, Bonfire Night. Each year we also host educational guest speakers. Shout Out Days: “Shout Outs” are your chance to experience your farm in action., your chance to get dirty. These are not mandatory but strongly encouraged for you to reconnect to your farmer and the place where your food is grown. All Farm events are announced by email. Want to included in our Workshop Email List?